Manufacturers always enhance their electronic gadgets by improving the gadgets’ features and specifications. Gadgets with more features and able to perform multi tasks will gain more popularity and increase the market shares. Having said that, sometime there are exceptional cases. Hewlett-Packard’s Printing Mailbox is a very good example. The HP Printing Mailbox is designed solely for people who do not use a computer or who are not online. The market segment is quite different but it works. Generally, the HP Printing Mailbox looks like a conventional inkjet printer, except it plugs into a phone jack instead of a computer. The HP Printing Mailbox works exclusively with Presto Services. To use this Printing Mailbox, you need to register with Presto Service first. After registering, you can add your friends’ email and phone no in your address book. When you receive email from your friend in the contact list, the Presto Service will convert the email and photo attachment into Presto Mail – a beautiful and easy-to-read colour printout to the HP Printing Mailbox on a daily schedule for printing. 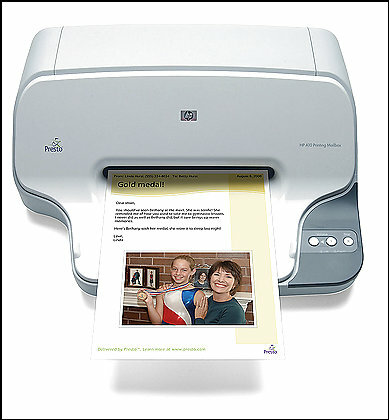 The HP Printing Mailbox will print out the email for reading. The Printing Mailbox is a one-way street, it can only receive email but it can’t reply. You need to make a call to the sender or write/fax him your reply. The HP Printing Mailbox will only accept email from people in the owner’s address book. Nevertheless, your friends can add themselves to it by visiting the Presto site and entering an access code, provided on a set of Friends Cards that the Mailbox prints out. The printer will download new messages everyday. The printing speed is quite average but it is quiet while performing tasks. Users are also allowed to customize its printout formats. How much does it costs you? Well, the HP Printing Mailbox is priced around $149.99. The monthly service charge for Presto Service is about $9.99 for an unlimited number of email messages, photos and articles. There is no cost incurred for senders.